Arooooooooo! 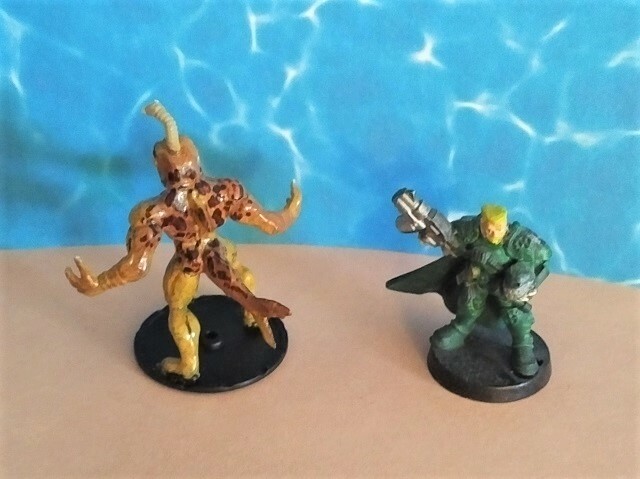 This is just a couple of simple headswaps. 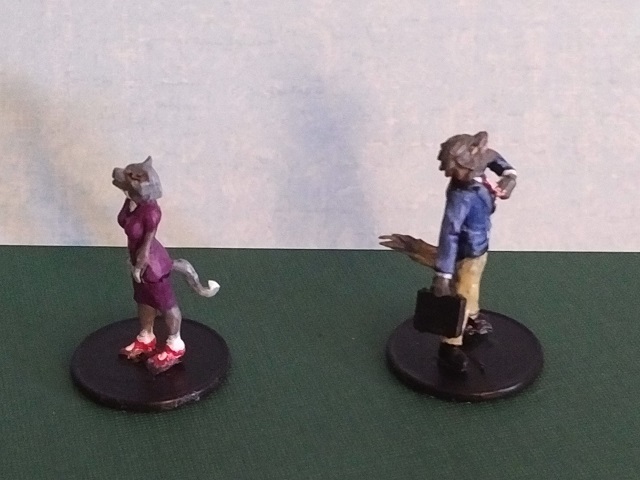 I have a large number of anthropomprphic dogs and lycanthropes that I use for this type of conversion. This is my first foray into civilian dog people. I like them, so they may become a nice, distinct scifi civilian population after a little, "Rinse. Repeat." This pic is really about the guy in the middle. 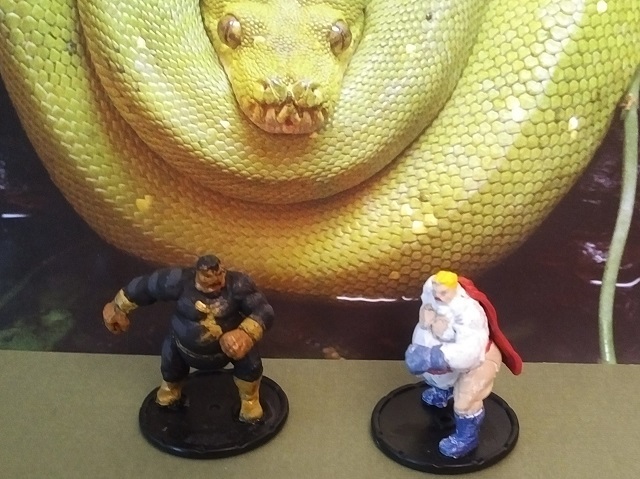 I got him is a set of discounted figures from a game that either didn't do well - or - someone overbought and wanted to get rid of. He's in there with my other "little people" fantasy races. Since he is fairly chibi proportioned, I think he will work well with the "old school" hobbit and gnome, but not with the new one. 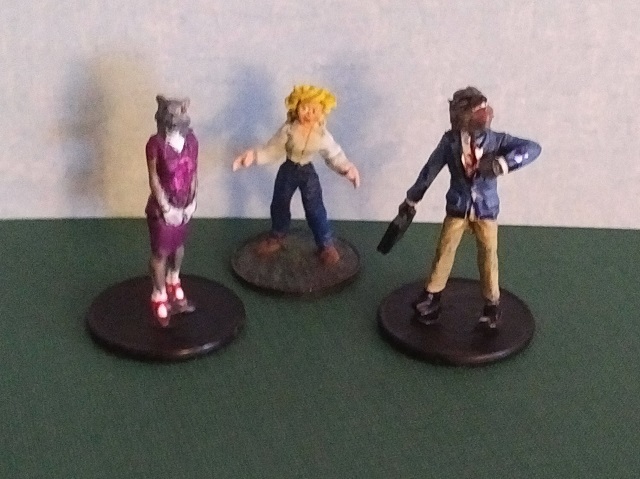 A decent fit with the other one (far right), which is my own conversion from some Medieval German figures. Speaking of fitting in, this is the rinse and repeat thing. I frequently see a hero or single figure that will work well as a rank in file figure. 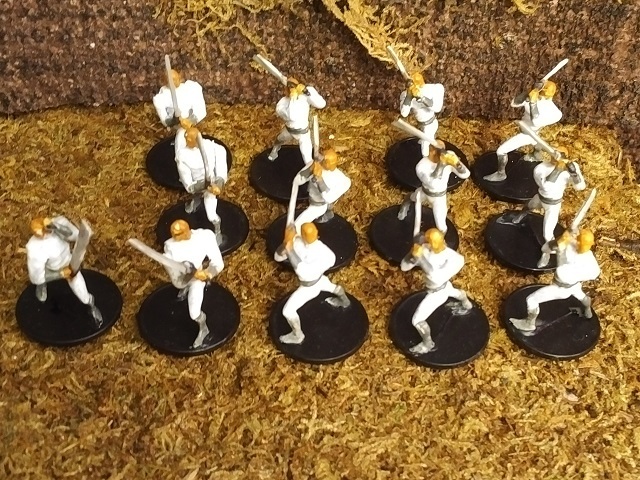 This set of Kyodia Ken (Batman Beyond) changes colour to white outfits and fills out a nice group of generic marital arts swordsmen. The sword that came with the figure was horrible - too thin, so they bent every which way. But that is OK ... by replacing the blades, I got the opportunity to individualize them a bit, so I didn't have to do too many arm repositions to get variety in the hrode. Speaking of variety, this BB Mr. 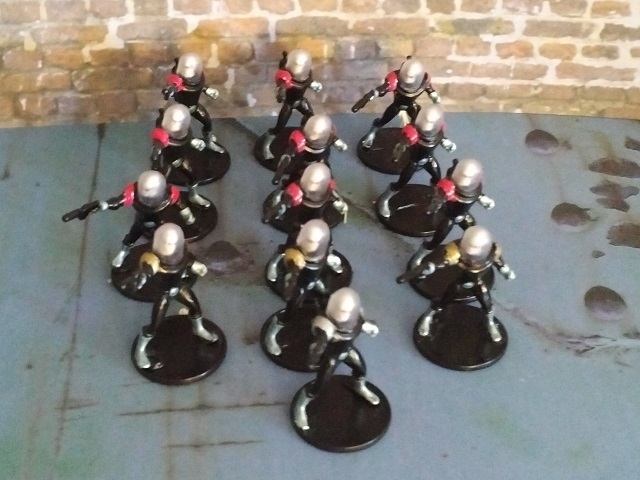 Freeze figure makes a good rank and file scifi troop. I just redid the shouldpads to give squaddies (red), teamleaders (gold), and a squadleader (silver) ranks. 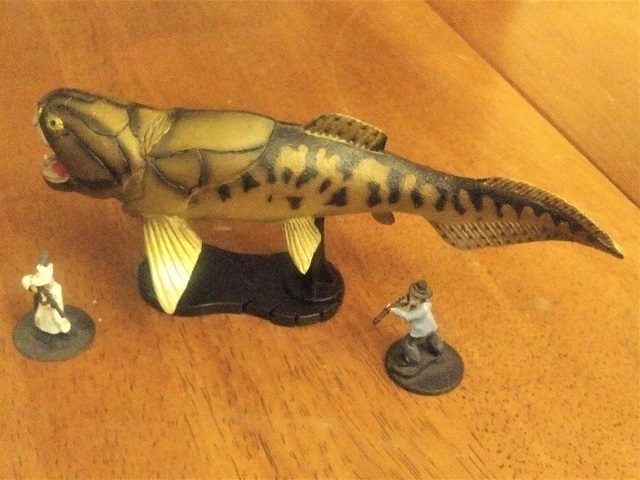 Several sets of these will make up a nice defense force or set of invaders. 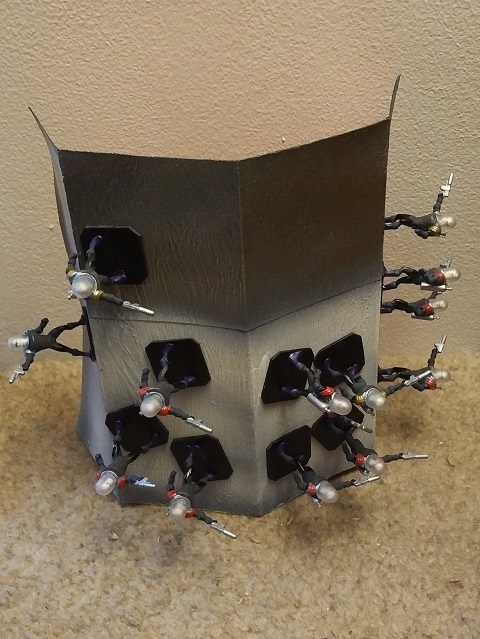 Especially when you base some on magnets, so they can go on terrain that has magnetic paint underneath. Very Spacey. 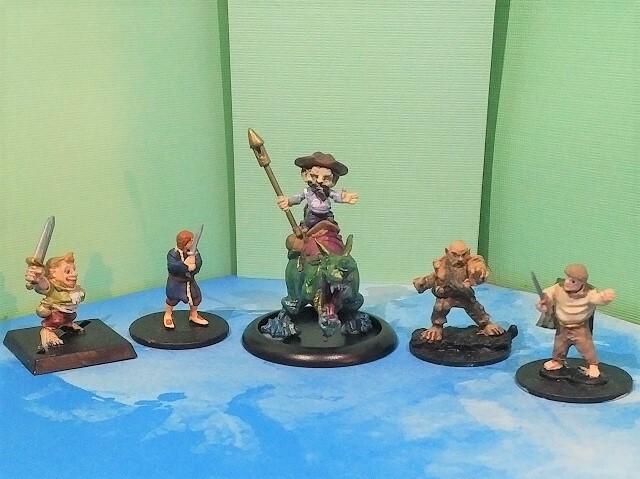 This requires plastic figures, but since those are so light, you can just go with excess fridge magnets you get from various places for the bases. 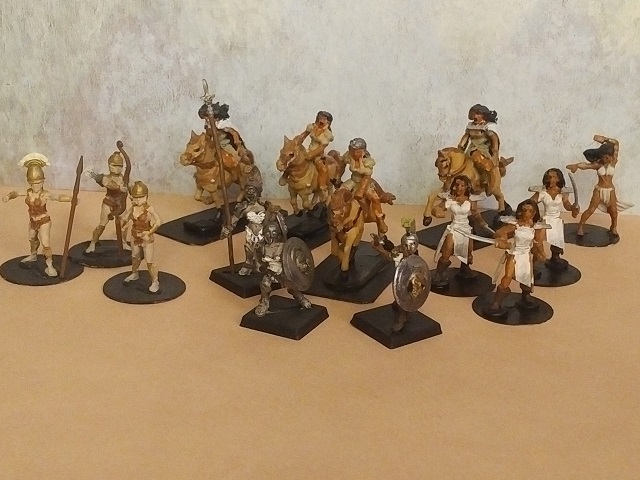 Here's a sample of my various Amazon forces, including the cavalry, which are converted to be so. 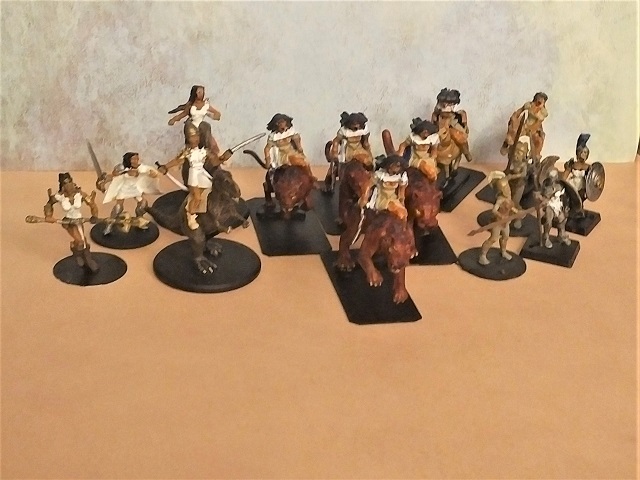 And speaking of converted cavalry, if I already some some on dinos, why not put a few on giant cats, too? Or whatever cavalry you want. 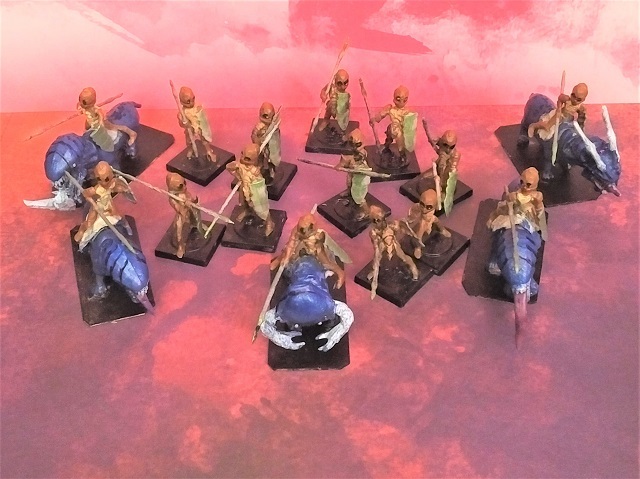 These guys (Elves with bulby gas mask heads to make primitive aliens) are riding the bodies of cheap kid's toy dinos whose heads were used for other conversions. 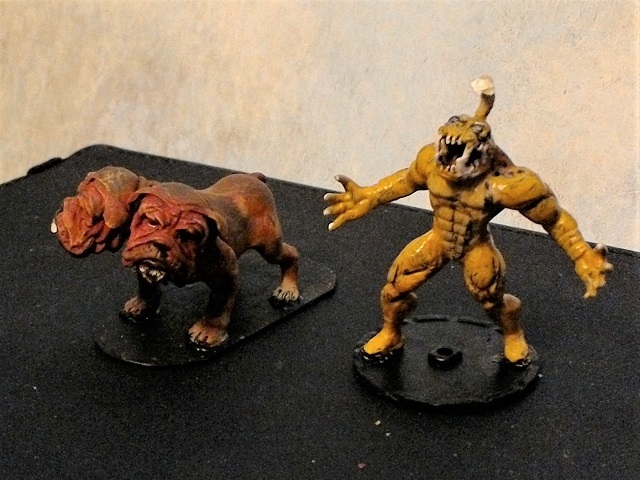 I like these Tyrranid heads, since I can get them fairly cheaply as excess bits. They really liven up quadraped bodies. 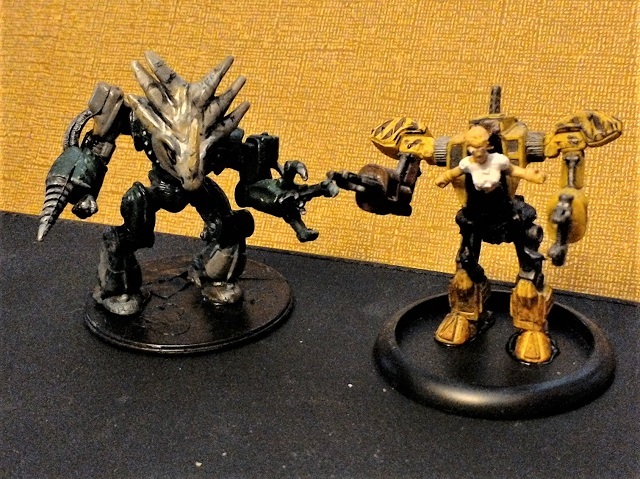 And speaking of what do you do with cheap plastic dino heads, one answer is to put them on old MechWarrior bodies. Nice, armoured scifi dino trooper. And since the MechWarrior bits are out, how about this one ..? I really like the industrial mechs for scenarios, and they convert to 28mm suits very nicely as well. Something more pedestrian. Well, actually, getting some guerillas to not be pedestirans. 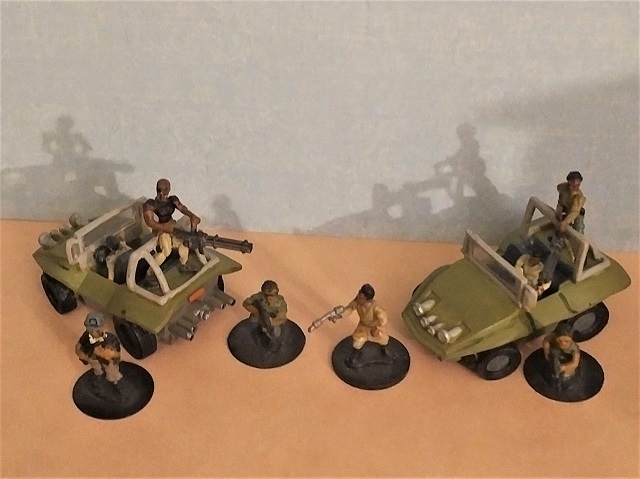 HeroClix put out this dune buggy which is a really nice size to make some small tactical vehicles by adding a driver and a tactical gunner. Not to ... well ... you know. Not a lot of WIP in this menagerie. Most of these were taking care of the leftovers from other conversions. These were just some WH horse bits I got in a job lot. 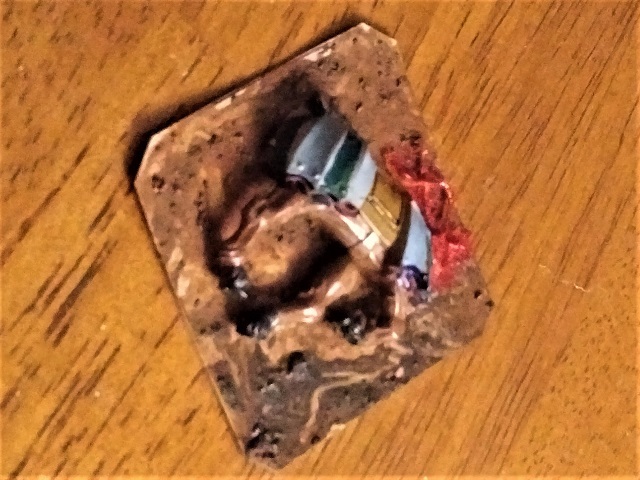 Not enough to make a whole horse (I did cobble together some complete horses, but always have bits left over), but enough for the start of my cavalry casualty markers. Or maybe just some carrion lunch set dressing. Then paint him up. 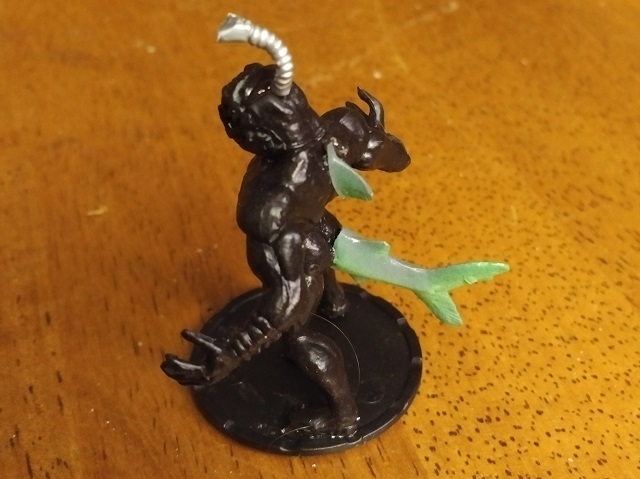 From his base figure, he's a little bigger than a 28mm human, but he's a monster, so that's OK. He fits in well with my other aquatic horrors. And here's how he looks from the front. Along with a giant two headed dog. Which normally comes with only one head, a problem that is easily fixed. Which then leaves us with the "problem" of a headless dog body. 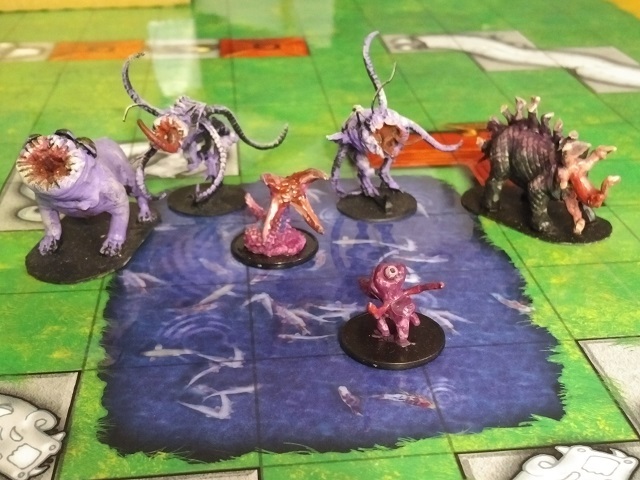 Not much of a problem if you need nameless horrors. And sometimes, you just want a variant. And you have just the right figure to do it ... like the Blob from X-Men. These guys are variant enough. 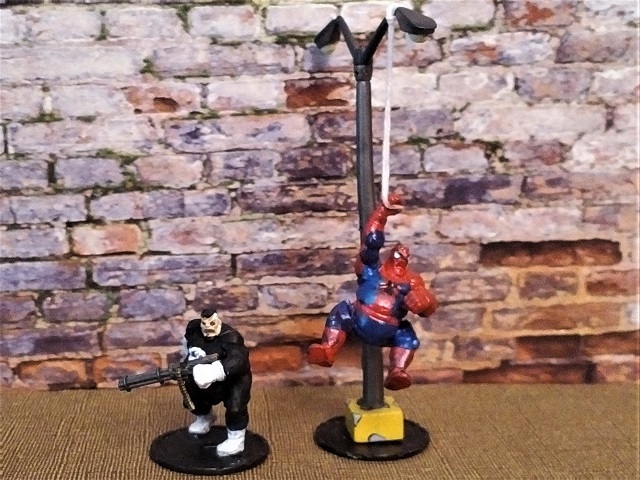 Note that Spidey swings, as he is just tied on with a bit of excess crosstitch floss. I was happy to do something with the streetlight. 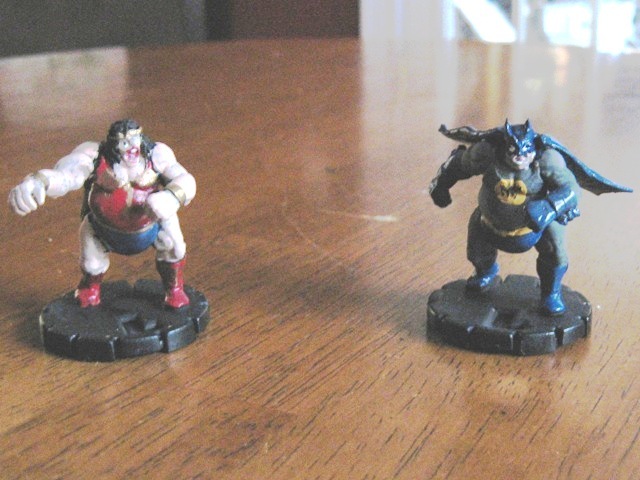 It is a good one that came in a kit with other HeroClix terrain pieces. But there was only one. Really hard to work that into a street scene by itself. And just so DC doen't feel left out. Well, they shouldn't since my first Giant Sized Super Heroes were also DC characters. So these last four are just an extension of the things you can do with the Blob.